We have them, we take care of them, we like them because they look nice and we need them to feed. But what do we actually know about them? Our teeth grow twice in our lives – by the age of two, we get 20 primary teeth that are later, throughout our childhood, replaced by permanent teeth (32 teeth in total) which are supposed to serve their purpose for the rest of our lives, or at least for the most part of it. It is generally said that a tooth consists of a crown (the visible part of the tooth), a neck and a root. 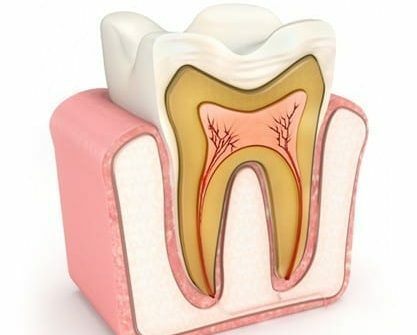 The root is a part of a tooth that connects it to the jaw. It is planted deep inside the jaw bone, and it is made up of dentine, a substance covered with a layer of cementum. Apex of the root of the tooth is very important, because through the opening (the apical foramen) which is located at this spot, the nerve and blood vessels pass through the tooth. The neck is a part of a tooth that connects the crown – the visible part of the tooth, with the root, which is inside the jaw bone. As we already mentioned, the part of the tooth visible to us is actually the crown of the tooth. The crown is covered with fissures and cusps that facilitate the food-chewing process. You have certainly noticed the difference between the crowns of incisor and canine teeth and those of the premolar and molar teeth. The crowns of the anterior teeth have sharp edges and their primary function is to bite off chunks of food, whereas the crowns of the posterior teeth have a biting surface whose function is to chew and grind food. The crown is made up of five surfaces: the occlusal (the chewing surface), vestibular (facing the cheek), lingual or palatal (facing the tongue or palate), mesial and distal (the surface of a tooth that touches a neighbouring tooth’s surface). This is why it is very important to use dental floss, in addition to the tooth brush, to clean all the surfaces between the teeth. Dentine is the basic building material of teeth. Dentine of the crown of the tooth is covered with enamel, whereas in the area of the root it is protected with a layer of cementum. 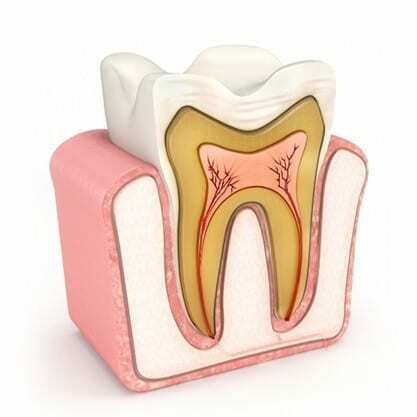 Dental pulp fills out the interior part of the tooth and it includes the tooth nerve, artery, vein and connective tissue. The role of the pulp is to nurture the tooth. For our teeth to be healthy and long-lasting, we need to take special care of them, to nurture and protect them.